After great response to our free Newsletter Subscription Form Plugin. 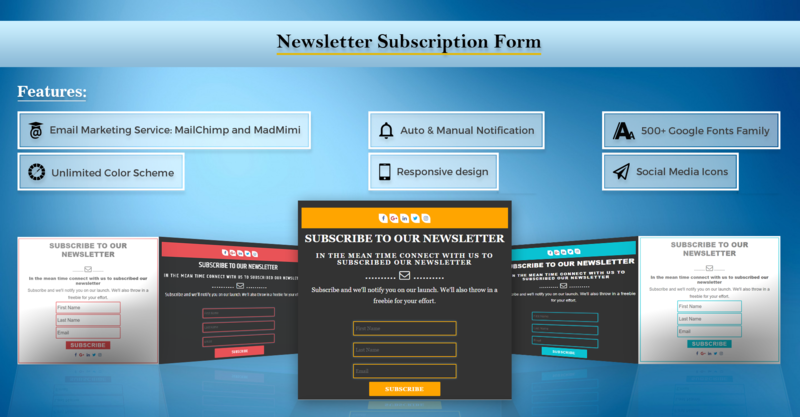 We are glad to announce Our new Premium Plugin Newsletter Subscription Form Pro for our WordPress Users. Newsletter Subscription Form is nicely track to your Subscribers and send emails. Allows collecting all visitors to emails Auto and Manually Notify system. This plugin is a responsive subscription form for blogs and page by widget and shortcode. We have added 4 more beautiful templates with pro version. You can manage your subscriber with data table and export as CSV file. You can add unlimited Social Icons with form. Here we are discribe a way to customize the form with shortcode and Widget sidebar section. [ wnlsp_theme1 id=”511436″ theme_color = “#FF2E34” bg_color = “#555” content_color = “#fff” select_form = “madmimi” ] shortcode : Show Custom newsletter form with 1st template. Easily customized with Theme, background and content color change short code attributes . In widget section, Drag and drop Newsletter Form widget menu at a sidebar where you would like to show. choose a output template from select list. 7. Subscriber Form show from widget and by short-codes. IMPORTANT: If you found a bug in Newsletter Subscription Form Pro plugin or have any problem/question concerning the plugin, please post your query into Newsletter Subscription Form Pro Support Forum here in our Forum. If you do not find a solution here, do not hesitate to contact us at lizarweb (at) gmail (dot) com.